Geomática, análisis y desarrollo SIG. The level 1 seismic microzonation study of the Pietramontecorvino area (Apulia, Southern Italy, located along the Central-Southern Apennine chain) is part of a project, in collaboration with the Basin Authority of Apulia (Puglia AdB) and the Department of Geology and Geophysics (DGG) of the University of Bari, aimed at the seismic microzonation of 63 Municipalities of the area of Foggia. The activity was promoted by the Italian Department of Civil Protection (DPC) and financed by the Interministerial Committee for Economic Planning (CIPE n. 20/2004). The seismic microzonation evaluate the seismic hazard at the local scale proposing to identify areas of territory characterized by homogeneous seismic behavior. The first level of seismic microzoning has the purpose of defining the lithological properties and geometry of geological units that characterize these portions of territory (microzones). The observation of the damage caused by an earthquake often shows variations at local scale caused not only by geological structures but also by different quality and type of building structures, resulting in different seismic hazards. The seismic microzonation evaluates the local seismic hazard, through the identification of areas of territory characterized by homogeneous seismic behavior. The Guidelines and Criteria for Seismic microzoning 2008 (http://www.protezionecivile.gov.it/jcms/it/view_pub.wp?contentId=PUB1137) provide standards for seismic microzoning studies on Italian territory; they distinguish three levels of increasing depth (from 1 to 3). The scope of this work is to contribute to the creation of a methodology for processing topographical, geological, geophysical and geo-technical data aimed at level 1 seismic microzonation map drafting, through the use of open source tools. 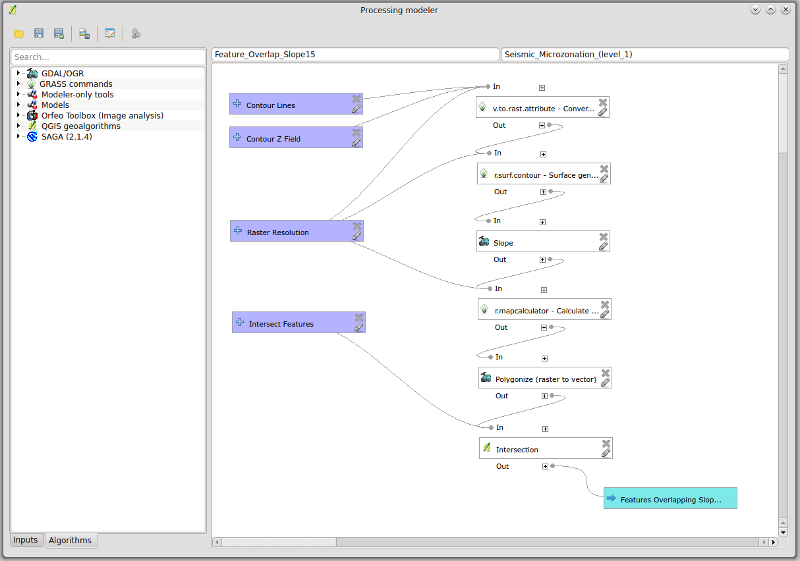 The Graphical Modeler tool integrated in the latest version of QGIS (2.8.1 as of writing) has been used for the creation of a simple geoprocessing model. This tool is useful to automate one of the analysis commonly performed for the creation of level 1 seismic microzonation maps, in particular to identify unstable zones as polygon features. 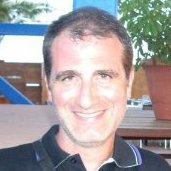 El modelo hace uso de diferentes software y bibliotecas de código abierto (GRASS, GDAL, QGIS), demonstrando la utilidad de QGIS como un interfaz simplificado y unificado para herramientas SGLCA (Software Geoespacial Libre y Código Abierto) (Fig. 1). (Fig. 1) Captura de pantalla del modelo de geoprocesamiento. El nombre de la capa polígono resultante. (Fig. 2) Formulario de entrada del modelo (izquierd) y registro de ejecución (derecha). La herramienta QGIS «Intersección» es usada para sobreponer las áreas con pendiente mayor a 15 grados con la capa escogida de intersección. The result is a polygon layer with areas prone to instability due to a slope value greater than 15 degrees, automatically extracted from a thematic map such as a landslides polygon layer (Fig. 3) or a lithological map. (Fig. 3) The model output (in red) shows highly unstable areas extracted from a landslides layer (orange). This work clearly demonstrates that open source GIS tools like QGIS, GRASS, GDAL/OGR, can successfully be used for spatial analysis and data processing aimed at first level seismic microzonation studies. In this example work, QGIS has been used as a simplified and unified interface for different high quality GFOSS tools; the Graphical Modeler allows to intuitively construct geoprocessing models that can be easily shared as portable and cross-platform tools that doesn’t require expensive software licenses. 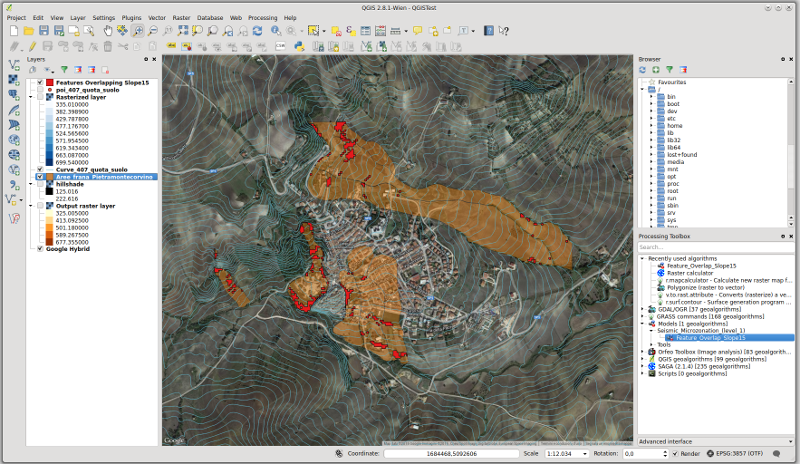 The tool leverages the QGIS modeling capabilities to graphically chain different algorithms, defining input and output parameters and leaving to the software the task of managing intermediate data output. The use of GRASS algorithms does not require defining and using a GRASS database and mapset, greatly simplifying the design of the model. Future developments include the creation of a package of tools and models, based on open source software, that can be used to simplify and speed up spatial analysis tasks necessary for seismic microzonation studies. Este artículo fue contribuído en Marzo 2015 por Giuseppe Cosentino y Francesco Pennica (www.igag.cnr.it). 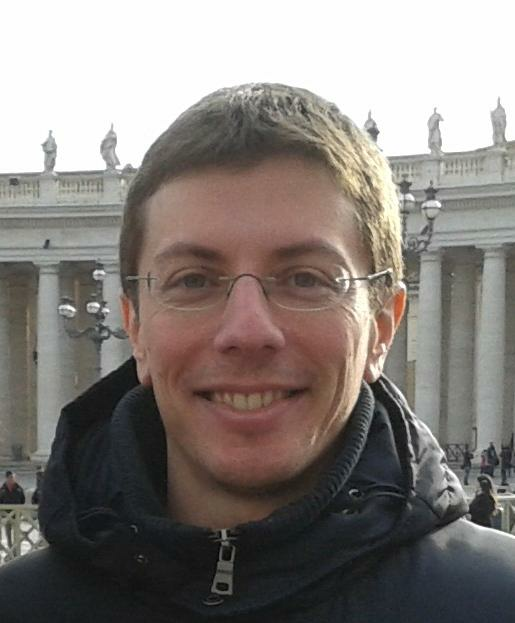 Giuseppe Cosentino <g.cosentino@igag.cnr.it> is geologist and technologist specializied in Geographic Information Systems for the management of geological and engineering hazards. Currently working in the field of seismic microzonation and environmental characterization of the lands in contaminated sites. Areas of interest: geological and environmental hazards, cartography, structural geology, explorative drillings.